Around 1-in-10 piglets in commercial farms die from being crushed by their mothers, with the number even larger on organic farms. Last year, this resulted in the death of 13 million piglets in the US and 116 million globally, according to Iowan agtech startup SwineTech. 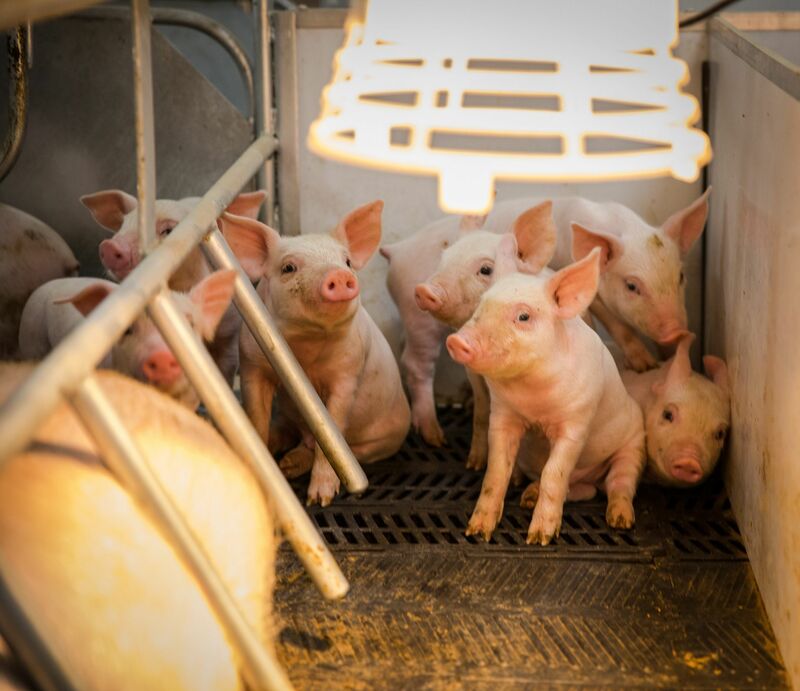 Eight-five percent of these deaths occur in the first four-to-six days of piglets’ lives. This costs the average hog farm over $700k a year and the industry as a whole $8.9 billion a year. SwineTech is on a mission to substantially reduce this number, if not eliminate it, with a wearable device for a mother pig — sow — that sends an impulse to her when she is crushing a piglet. SwineTech detects this with another device, installed in the sow’s farrowing stall, which detects and measures piglet squeals, and has been trained to pick up the specific squeal of a suffocating piglet. The wearable device can also feed information back to the farmer about the state of the sow’s overall health, in a ‘Fitbit for pigs’ type product. Currently, hog farms aim to prevent sows from crushing their litter with spokes within their stall restricting how they lie down sideways. 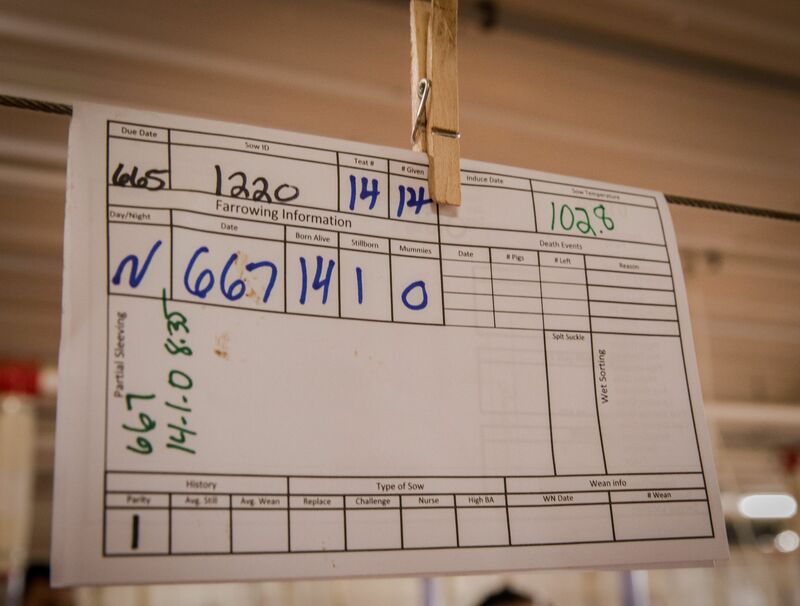 This image from Iowa Select Farms near Des Moines, the largest pork producer in the state, shows the current system. But these are not 100% effective, a representative from Iowa Select told me, and Matthew Rooda, the founder of SwineTech, agreed. This week, SwineTech raised $1.3 million in Series A funding from a wide range of high net worth investors, farmers, investment networks, and accelerators including Quake Capital from New York, the Iowa Startup Accelerator — which SwineTech took part in two years ago — and the AgVentures Alliance. “We raised the round from 19 investors from all over the US – NYC, Texas, Minneapolis, Iowa, and more — with individuals worth between $1 million and $200 million, including farmers, bankers, and lawyers,” said Rooda. SwineTech’s participation in a range of pitch competitions and accelerator programs helped to the company get the attention of this diverse range of investors, Rooda told AgFunderNews. The competitions it has won include the 2016 International Business Model Competition, hosted by BYU, Harvard, and Microsoft a student innovation award from MIT, and the Natural Student Entrepreneur of the Year. The University of Iowa, where Rooda is studying Enterprise Leadership and Pre-Veterinary Medicine, also made introductions through its JPEC program, as well as the Iowa Startup Accelerator, he added. Sow with wearable strap – image taken from a SwineTech presentation. SwineTech will use the funding to manufacture its devices and officially commercialize the product, although it already has a few large paying customers. In the future, SwineTech also hopes to provide other digital tools for hog farmers to help with the documentation of antibiotic use, in particular. Currently, this is done with a combination of pen and paper, and later transcription to a computer with lots of room for error. Rooda also sees an opportunity to provide better ways of streaming data to vets and other interested parties involved in an operation. He is interested in learning from innovations in the dairy sector that aim to solve similar problems. During a recent tour of Iowa Select, I noticed that farrowing notes about each sow and her litter were kept on a piece of paper clipped above each stall, which was surprising for such a hi-tech facility. But it became clear in my conversation with Rooda that a technological alternative does not yet exist. New technologies in the swine industry, and livestock overall, are relatively few and far between. In 2016, just $152 million of the total $1.4 billion raised by farm technology startups went towards businesses innovating specifically for animal agriculture, excluding seafood, according to AgFunder data. 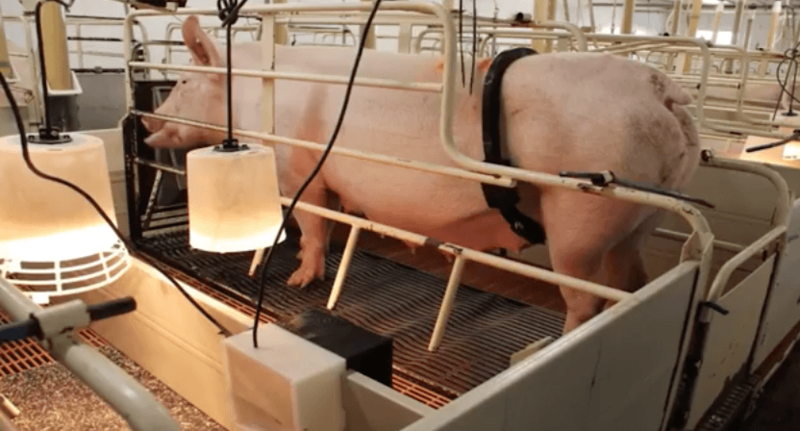 SwineTech has had the backing of a few major organizations including the Iowa Department of Agriculture, and is working towards an arrangement with an animals rights group. Rooda aims to roll out SwineTech to the largest corporate hog farms first, where they can make three times return on their investment, purchasing the product for around $1k, and getting $3k back in savings from saved piglets. Image credit: Iowa Select Farms, by Tyler Mertins, National Press Foundation.